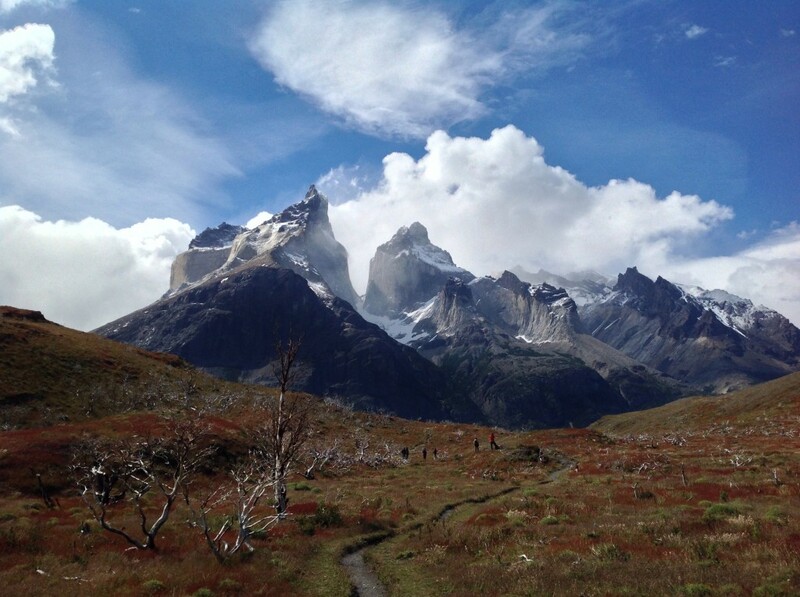 Our last hike at Torres del Paine took place in the afternoon on New Year’s Day. Although the magical Horns’ twin peaks had been pointed out to us, they were always enshrouded in mist. The afternoon walk commenced with a quick stop at the visitor’s center placed at the edge of a river and surrounded by fields of multicolored lupins. 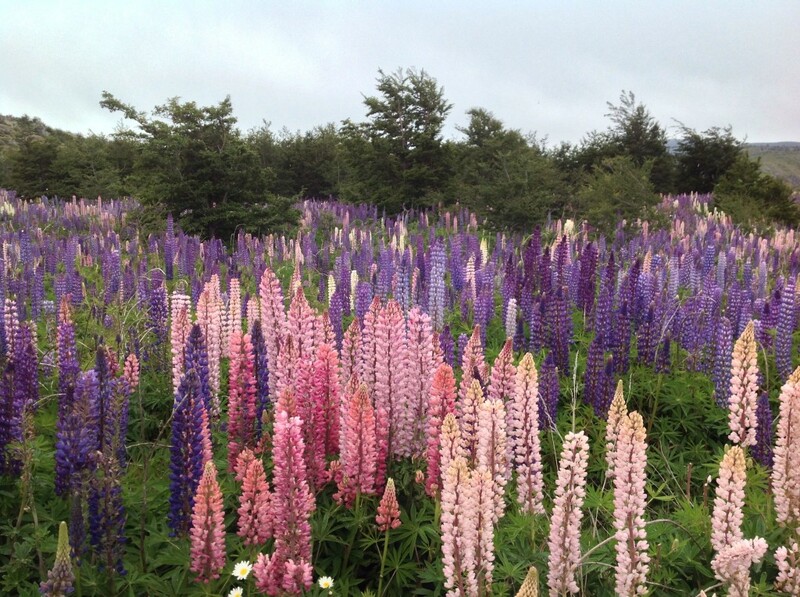 Fields of mulitcolored lupins were everywhere, including some colors I had never seen before. After the visitor center, the bus took us to a lookout point of the Horns to eat our lunch in front of the beautiful scenery. Unfortunately the Horns remained invisible due to all the mist, but shortly after, we started our hike to get a closer view of the Horns at this waterfall. The sound of the water rushing over the edge felt cleansing and refreshing. 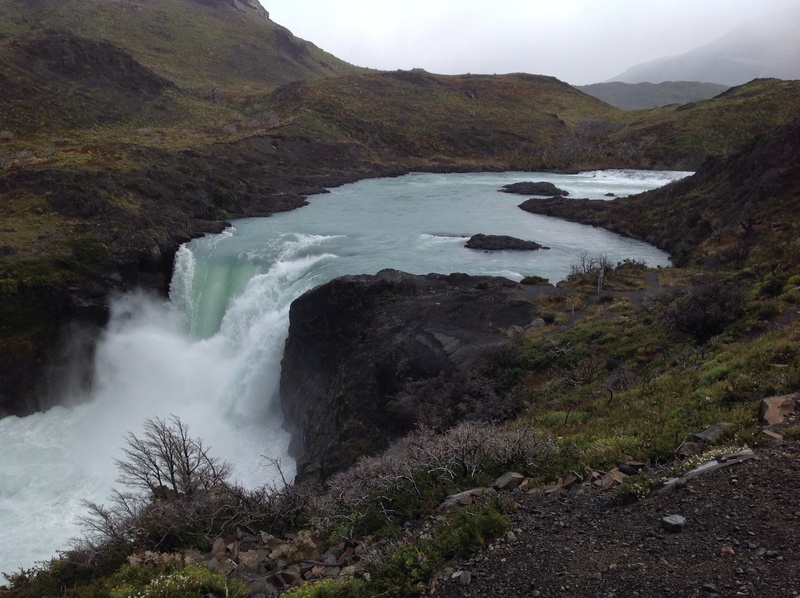 The hike commenced with this stunning waterfall. The air was cool and moist. As usual, the strong Patagonian winds whipped around changing the weather from warm and sunny to sideways rain in a matter of minutes. The landscape revealed the charred remains of a fire, creating natural sculptures in every direction. The stark whiteness of the tree branches stood out against the greens, reds and oranges of the living plants surrounding them. 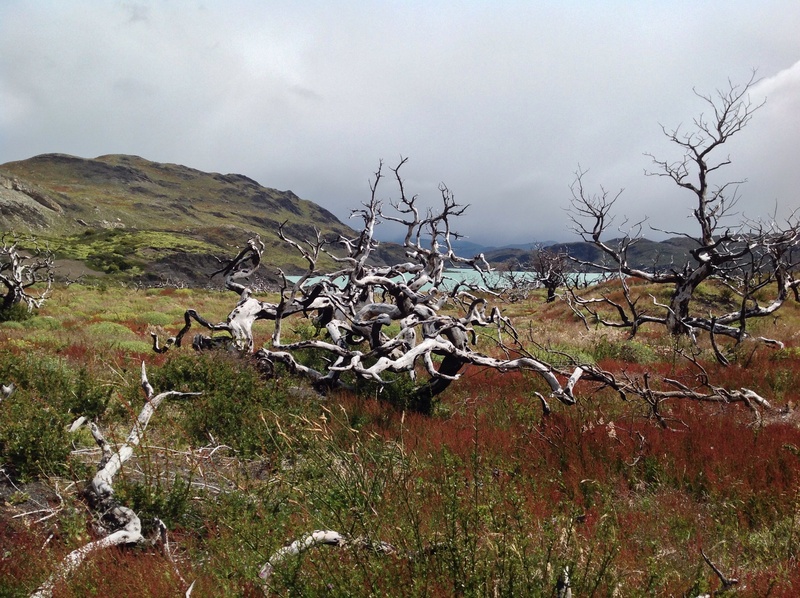 Remnants of a fire created natural sculptures in every direction. Each burnt stump was so unique it was almost like walking through an art gallery. After reaching the second lookout point for the Horns, we rested waiting patiently for them to reveal themselves to us. Despite the winds, the sun was shining for a while and it felt nice on my skin. On the return, we finally got a view of the peaks for a brief window of time before the mist rolled in again. A rare glimpse of the Horns’ peaks. We were lucky to see them as we were hiking back. Really beautiful. You have captured the essence. Thanks for sharing.